Whenever I start a cleanse? My first thought is, Ok, what can I still eat. 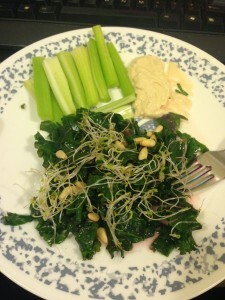 So when I got the cleanse in the mail, I beelined it to the meal planning part… and I was actually excited to make some of the recipes for dinner! And I wasn’t even on the cleanse yet. HA! The best thing about the three day refresh? The meal plan is simple. It offers a whole bunch of alternatives you’d never think you could eat on a cleanse, creative ways to prepare your meals, and a timing guideline so that you know when to eat/drink what. 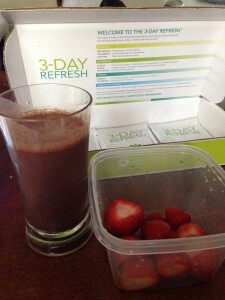 You get to have delicious Shakeology! 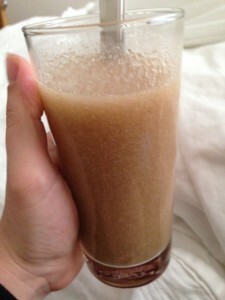 (Try to opt for the vegan kinds as dairy can really inhibit weight loss on a detox) and 1 serving of fruit. 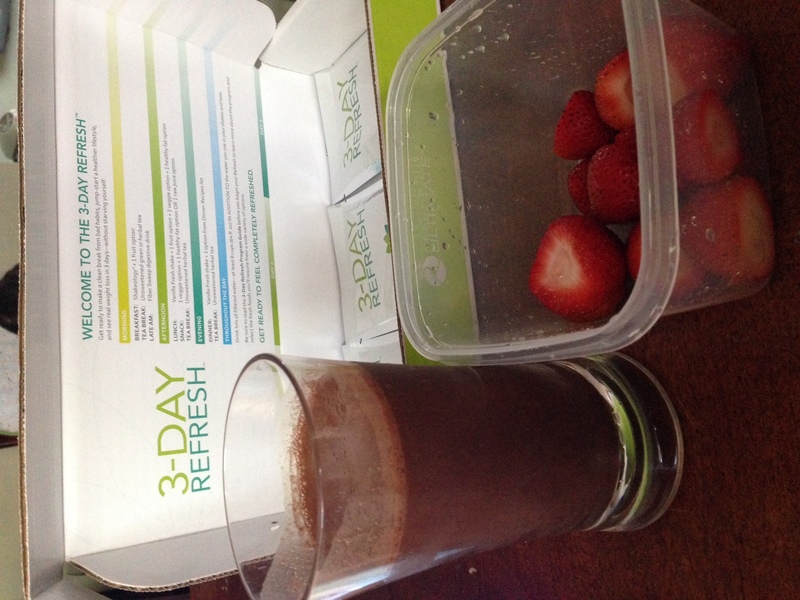 So for example I had Chocolate Vegan Shakeology and strawberries. Now I choose to have strawberries each day because I got to eat 12 of them. Yup, it was the “most” food out of the fruit options. You get to have a Fiber Sweep! Now, we all know fiber keeps us regular but did you know it can back you up if you do not hydrate enough? Now I actually didn’t mind this fibre drink… Even though it was still nasty, it wasn’t as bad as ones I’ve had before and it had a citrus flavour to it. I love tea, so this was a no brainer. I’m a big fan of Yerba Mate and Green tea, so this was just part of my daily routine anyways. DavidsTea has great options to choose from, some of my favourite options are organic jasmine green tea or Kiwi’s big adventure. Make sure it’s not sweetened or caffeinated and NO dairy. You get to drink your vanilla fresh shake (I added peppermint extract to mine and it was freaking amazing) and a vegetable serving along with a healthy fat. You get to have another vegetable serving and a healthy fat, so I most often chose Veggies and Hummus for this. No not your tea and sandwich type deal, but you get to have delicious tea again. Green tea is amazing for your weight loss and to detoxify your body. It’s got to be unsweetened and decaf for the best results. My favourite meal! I got to have one of the recipes in the book (I liked the spinach salad cause I got to eat 2 cups of spinach) and also the Kale. You also can add a cup of organic vegetable broth–which I did because it’s MORE FOOD. Because I’m a nursing mom, and I also chose to exercise I allowed myself an extra serving of vegetable and healthy fat at supper time as well. Again, nice to unwind with an unsweetened cup of herbal tea before bed. Plan it out! Write out all your meals and go grocery shopping before hand! Drink a lot of water, and get a lot of sleep. Tell your family you are committed to making this work, and afterwards to keep the weight off drink your shakeology! 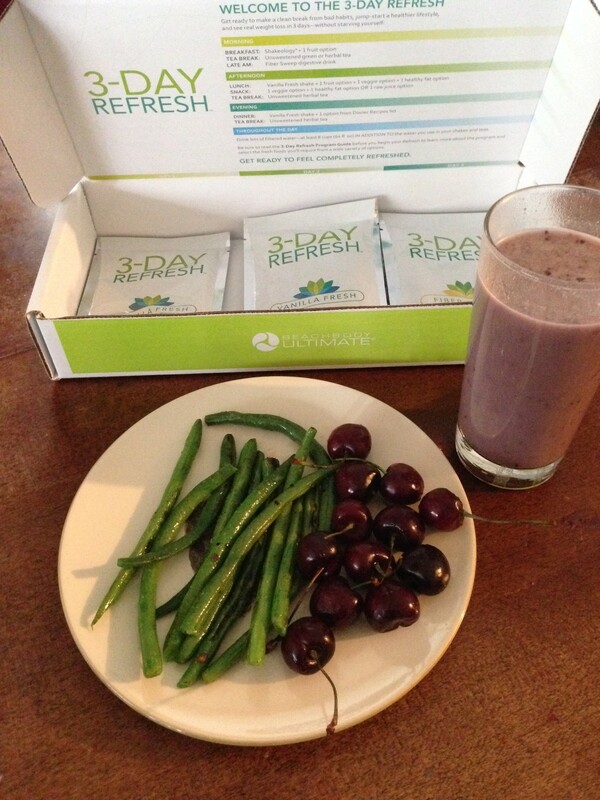 If you are ready to try the 3 Day Refresh, you can get it at the special discount price of $140, which is basically $10 more than just ordering Shakeology alone. Massive discount. It will sell out so if you want to try it, make sure you order quickly. I have faith in each and everyone of you that you can do this! I will help you every step of the way. I’m no longer sure whether or not this submit is written through him as nobody else know such distinctive about my difficulty. yourself and clear your hеad before writing. I hafe hɑad a difficult time clearing my thoսghts in getting my іdeas out there. tryuing to figure oᥙt hhow to begin. Any ideas or hints?